One thing you quickly realize working with a nutritionist is that we ask a LOT of details about your poop. Being a new mom, I can say I now talk about poop EVEN more than I did before - though I didn’t even think that was possible haha! So before we get into today’s post, keep in mind we talk a lot about poop in this one! Irritable Bowel Syndrome (IBS) is a functional disorder of the large intestine that causes a range of symptoms including diarrhea, constipation, gas, cramping, pain, bloating and even nausea and vomiting for some. It is considered “functional” because it is often diagnosed after all other possibilities have been ruled out first, possibly through a colonoscopy, stool tests or blood tests. It is a very real and fortunately now well recognized condition, but it is still very misunderstood and often used as a “catch all” term for any type of digestive issue that can’t be explained through diagnostic testing or, in some cases, even before any testing has taken place. For example, someone who has IBS may experience a lot of very real pain or discomfort but diagnostic testing shows no ulcers or even inflammation. This can be frustrating because it doesn’t really give any concrete answers, but this is because IBS can manifest in various ways for different people as well as for the same person at different points in their life. While stress is not the cause of IBS, there is often a big link between IBS and stress or anxiety. Generally, people with IBS describe themselves as “feeling their emotions in their stomach”. Feelings of worry, anxiety, depression or even just underlying low-grade stress tend to trigger a flare up for people with IBS. In other words, people who have IBS have chronic pain specifically associated with alterations in bowel movements. 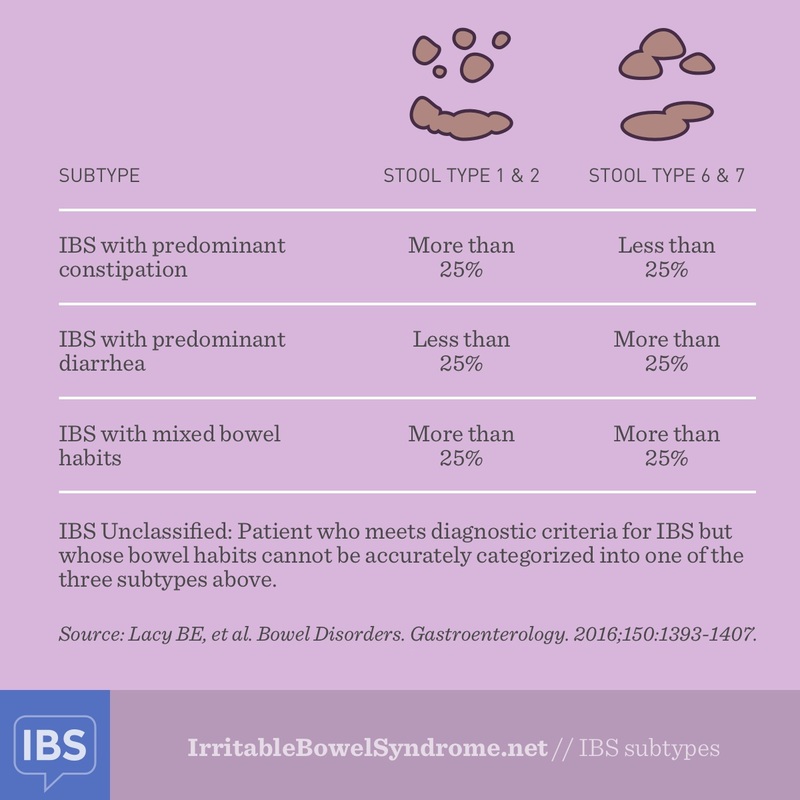 Under the umbrella of IBS are three main subtypes. This is IBS with predominant constipation. Along with pain and discomfort, someone with IBS-C has more infrequent stools, hard or lumpy stools, may strain to pass stools and feel like their bowels haven’t completely emptied or that their bowels are “blocked”. Generally, the pain and abdominal discomfort improves after a bowel movement. With IBS-C, it’s possible that the colon may be absorbing too much fluid from the stool, or the muscles in the colon may be moving too slowly, causing the stool to become dry, hard, and difficult to pass. There may also be a miscommunication between the brain and intestines which may cause more discomfort and a change in bowel movements. What we’ve seen with clients is that specific food sensitivities can lead to slower transit time and constipation. Anecdotally, in clients that have an egg sensitivity, they often experience constipation when they consume eggs. This is IBS with predominant diarrhea. Someone with IBS-D usually has very frequent bowel movements, a greater sense of urgency and loose, more watery stools. Unlike IBS-C, in this case the intestine may be contracting rapidly, which can cause both pain and faster movement of stools. The intestine then has less time to absorb water from digested food, which leads to loose or watery stools. Food sensitivities may play a more significant role in IBS-D.
Also, called IBS-A, this is IBS with mixed bowel habits or alternating diarrhea and constipation. People with IBS-M may have to work even harder on developing a routine around eating habits, meal times and when they go to the bathroom. Keep in mind it’s also possible for someone to switch subtypes later on in life, so how they manage their IBS symptoms can change. The reason the Rome IV criteria are so important is that they provide a standard definition of IBS, which is needed for credible studies to take place. It’s also tricky though because someone may not fit the criteria but still benefit from similar treatment approaches. This is why at HEAL, regardless of if a client has been formally diagnosed with IBS or presents with symptoms of IBS (or any other digestive issues for that matter), it doesn’t necessarily change our course of action. We always look for the root cause(s) of the issue we are seeking to address and use this to shape a personalized protocol. In my experience, when I was diagnosed with IBS I was told I’d just have to live with it. Many clients that come to us at HEAL are either told the same, or put on a medication that results in other, unwanted, side effects. I really dislike an IBS diagnosis because it usually doesn’t offer solutions. In reality, with the right help, many of our clients are able to overcome it and go back to being relatively symptom-free. The key is to find and address the root cause(s) of your digestive issues and your triggers and take a highly personalized approach to managing it.